Viña del Mar and Valparaíso used to be two physically separated cities long ago. Today they have merged into one. Moreover, they have grown to engulf Con Con to the north and spurted inland to Villa Alemana, Quilpué (where my daughter Rachel was born) and beyond. 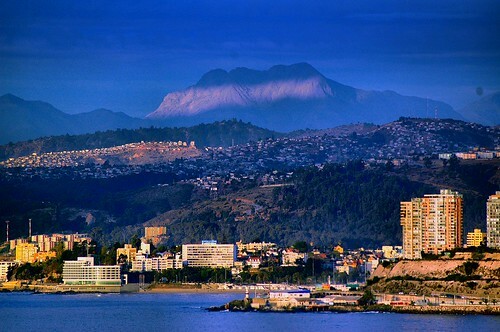 The area has a bit under a million inhabitants and is mostly Second World living–other than a good chunk of Viña del Mar (including Reñaca beach) and Con Con which are very First World. 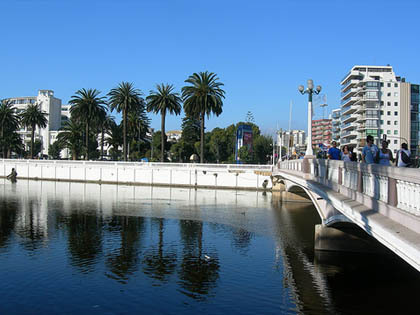 Indeed, Viña del Mar is the second most livable city in Chile besides northeastern Santiago, except in February. During that month a large chunk of santiaguinos move into town for summer vacation and cause the worst sort of beach and automobile traffic nightmare you can imagine. There is no lack of loud music at night either. January is not much better when the area is full of Argentines and Brazilians. Teenagers apparently love all the company. The best time for someone (especially over age 21) to visit is in either December or March. I recommend that adults visit the southern part of Chile during January and February and leave the beach and hassles to youngsters. Valparaíso was greatly expanded in the heyday of the British Empire when much shipping went around the horn. And there are still remnants of the British era: horse racing, cricket, rugby, Anglican churches, a British cultural center, architecture, soccer teams with English names, trains and funicular elevators that run on the “wrong side” of the tracks, etc. Even though it is very run-down, Valparaíso is a great place to visit for a history lesson. Like Viña del Mar, the hillside city is full of interesting nooks and crannies, winding narrow streets, quaint plazas, and great ocean views. Nobel Laureate Pablo Neruda’s house is there (now a museum). The Chilean Congress is also located in the city, and the Chilean navy is headquartered there. Fish is inexpensive. There are several good universities in the area like Universidad Federico Santa María (top engineering school) and Universidad Adolfo Ibañez (top business school). The view from either side above the crescent bay is spectacular. The climate is very similar to Santa Barbara, California’s (i.e., mostly dry and warm, rarely very hot, with rainfall only coming from April through October). The cost of living is almost 20% less than in Santiago. Rent for great view houses is very cheap from March to December. The air is clean. It is only a little over an hour to the Santiago airport, and about 2 1/2 hours to the Portillo ski area. Horseback riding is nearby (north of Con Con). People tend to be very friendly and helpful. The plaza in Viña del Mar is gorgeous. It is a city full of flowers. Our family lived in a nice cliffside home above Reñaca beach for 6 months in 1996. There were spectacular ocean views (maybe 300 degrees from my glass office space) I have lived a lot of places but I think that was the best house I have ever lived in on account of the view. I enjoyed listening to the waves crashing while lying in bed at night too. it is just amazing how u talked about chilean. i like it. It is just weird hear other talking about chilean culture.